It's Christmas in 10 days! Are you mommies ready with your menu and done with grocery shopping? Perhaps some of you are still thinking of what to prepare this year. I know it's sometimes hard to think of what to cook, considering the number of people in your family, the picky-eaters, kids with food allergies, etc. 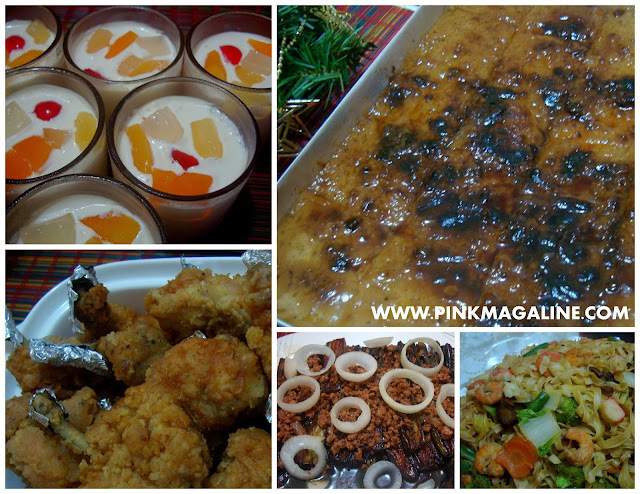 Here are some of the foods we served during the Fab Moms Christmas party. Most of them are famous noche buena favorites. You might as well consider them if you haven't finalized your menu yet. Clockwise from upper left are fruit cocktail gelatin, cassava cake, noodles with vegetables and shrimp, talong (eggplant) steak, and chicken lollipops. For our own menu this Christmas, we'll have a Filipino-style family feast of the all-time favorite buko salad, three choices of kakanin (delicacy), chicken embutido, beef caldereta, lechong manok (chicken roast), and barbecue. There will be a slight change too if hubby requests something else. On the other hand, we are yet to complete our grocery shopping 'cause these past weeks have been busy. Yesterday was elder daughter's reading recital and dance performance at her school and I have some visitors coming today, so that means we'll have a little bit of a delay in buying stuff. Ahhh.. good luck to everyone. Enjoy the holidays with whatever you can prepare for the family. The most important thing is the wholeness of the family, everybody is healthy, and there is love that grows strongly in your home. Merry Christmas!